Email is now an invaluable communication method in this day and age. We use emails to communicate with clients and internally with our staff. When adopting an email service we don’t hesitate to subscribe to the tried and tested Google Apps. As our business is internet based we want everything to be cloud based. This allows us to easily access our emails and documents from the cloud wherever we may be. 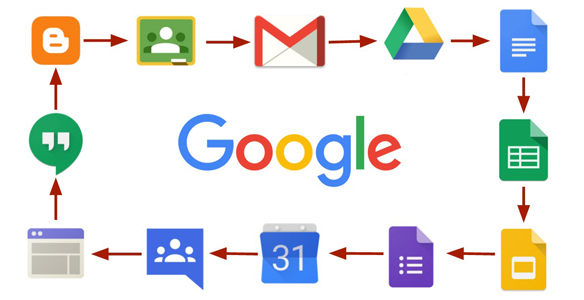 Rather than using Microsoft Office 365, which contains over 800 features we just won’t use, Google Apps is lightweight, simple, one size fits all, and covers all the basic features we need to run our business and is considerably cheaper. Google Apps doesn’t just supply a robust emailing service, but it also allows us to communicate with our staff directly with Google Hangout, chat with all of our colleagues directly on our email screen and phone. We can also schedule meetings with the rest of the team using Calendar. All of this comes with the added bonus of being able to collaborate, share documents and spreadsheets, with multiple users working on the same document using Google Drive. All of this is, of course, hosted on the cloud making team work quick and efficient. No project would be successful without proper planning, organisation, communication and delegation. Which is why we use Active Collab as our primary project management software at R & W Media. Every project we have is setup in Active Collab. It allows us to organise projects, setup milestones, and assign tasks to individual each team member. We can even invite clients in to view each project so we can discuss the finer details with them. They can also keep track of the overall project status. Keeping all documents, files, and communications under one roof in Active Collab reduces the probability that files are scattered all over the place and helps keep everything centralised in one location. Collaborating with team members is easy; the discussion feature allows users to create notes everyone can see that a document needs an edit, whilst being able to leave comments themselves. This furthers the ability to openly to discuss projects in thorough detail simultaneously keeping everyone to be up to speed. 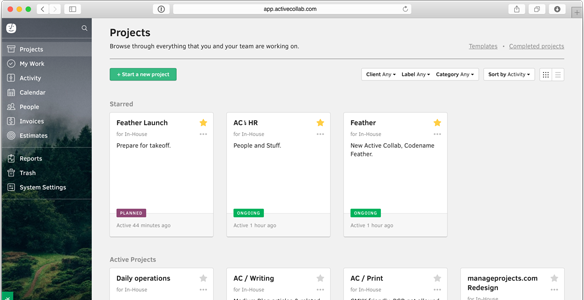 Active Collab is an invaluable tool to keep projects running on time and on budget. A major benefit of using Active Collab compared to other project management software is invoicing and reporting. With reports, we can calculate the total number of hours worked on a project and any expenses in order to correctly bill our clients. The invoicing feature in Active Collab is so straight forward, we can have invoices automatically generated and sent directly to clients. Active Collab can also send polite late reminders. Having a vibrant team with everyone being so busy is not an excuse for a lack of communication. Communication is incredibly important, especially as we’re such a dynamic office with staff not being solely office based and others working remotely. For active communication we use emails and Active Collab. 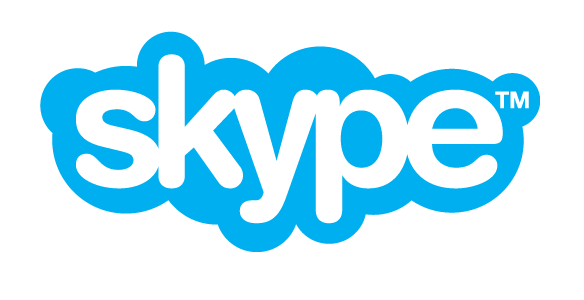 But for discussions, chats and direct messages we use Skype internally. Skype is great for quick discussions and asking colleagues quick questions. We can regularly screen share, great for demoing and showing bugs, and use video conferencing for team meetings. It’s great for on the go as well as direct call on the phone. Skype isn’t just useful for internal discussions. We have found a lot of our partners and clients also use it. This makes getting in contact more convenient for everyone and allows direct calls. We may look at using Slack or HipChat in the future as they provide more dedicated communication together in one place, including integration with other applications like Dropbox, git and many more. 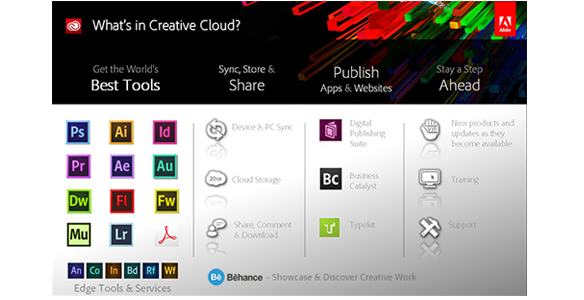 When it comes to designing, we use industry standard software Adobe Creative Cloud. This includes using Photoshop for all our designs, Illustrator for vector graphics, Indesign for print layouts, and Adobe Bridge for browsing and quickly previewing PSDs and other Adobe file formats. For all of our aesthetics, we use Adobe but, when it comes to wireframing and mockups, we use OmniGraffle. OmniGraffle is a fantastic tool for quickly producing mockups, prototypes, wireframes, and system designs. It’s so quick and easy to just throw a concept together with this tool. When we started out we stored all of our files, including documents, notes, PSDs, code etc., on an internal network storage server. This was prone to failure; one day a hard disk failure almost lead to all work being unrecoverable. We definitely learnt our lesson. There were certain limitations too. Internal network storage was sometimes slow, it was difficult to access this storage device when away from the office, and we had to manage the hardware ourselves. We really wanted to migrate to a managed cloud based file management system. Things changed when we fully adopted Dropbox. We’ve been using Dropbox for years but, when Dropbox released their business plan, we jumped straight on-board. 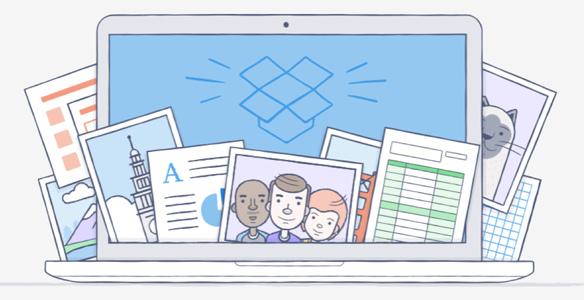 We now use Dropbox exclusively to keep all of our office files in one location; in the cloud. Dropbox Business provides us with secure file syncing and collaboration features. We can now manage project files more efficiently by configuring which files and folders are shared amongst our team, clients, and partners. Being kept on the cloud, it allows us access to it wherever we are, including on our mobile devices. We don’t need to worry about losing files as everything is backed up in the cloud. We also get unlimited storage and unlimited file recovery. When it comes to development there are a variety of tools available and it is mostly down to personal preference. Here at R & W Media, however, we use Sublime Text when focusing on front-end development. What’s great about Sublime Text is that it’s fast and lightweight and has a package manager allowing you to install many other useful plugins. 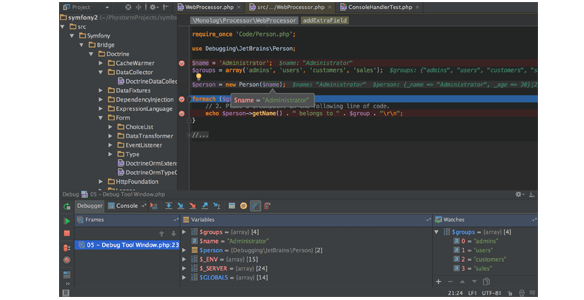 For PHP backend development, we use PHPStorm. PHPStorm is the best PHP IDE out there, it has everything a developer needs. It has some useful testing and debugging tools, powerful search features, an integrated terminal, and more. For managing local and remote MySQL databases, we use Sequel Pro on the Mac. It’s fast and easy to use with its graphical interface. Making edits to a database is easy, there are further advanced functions, and you can even repair or flush out databases. We use git to collaborate and track code changes, exclusively using SourceTree as our git client. SourceTree makes it easy to track all of our repositories and perform the all the useful functions of git all through its interface. When transferring files to the server or downloading from the server, we use the Mac software, Transmit. It supports FTP/SFTP and transfers to the cloud, directly to the Amazon S3. When it comes to hosting our git repositories, we use BitBucket. BitBucket offers many of the same features that GitHub does, but BitBucket is much more affordable when it comes to having a large number of private repositories. They offer an unlimited private repository plan only capped on the number of users. 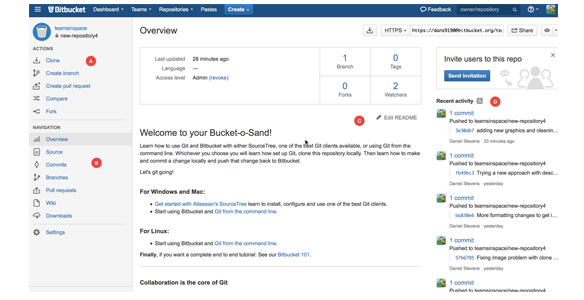 BitBucket allows us to manage and collaborate with our team of developers including code reviews, pull requests, and share repositories to specific members. All hosted directly on the cloud so that we can push/pull to our repository wherever we are located and even check it all from our mobile devices using the iOS app, CodeBucket. A major benefit of using BitBucket is the ability to integrate our repository with many third party applications. The trigger webhooks is especially important to push deployments to our environments. We automate our deployment process so we don’t have to manually deploy code to different environments, saving time and being less prone to errors. With our code repository securely hosted on BitBucket, when we push to a branch, BitBucket will trigger webhooks to inform DeployHQ to deploy our code for us. One of the biggest benefits is being able to rollback on a deployment should disaster occur. 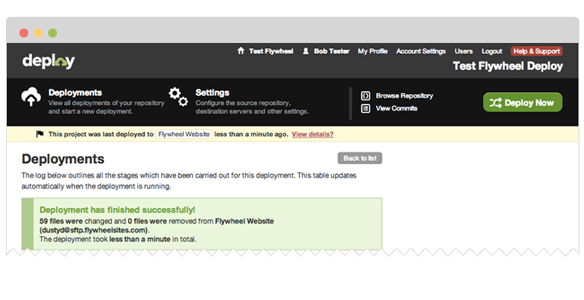 DeployHQ provides a user friendly interface so that anyone, even those who aren’t technically minded, including a project manager, can click on a button to simply rollback on a deployment and watch the process happen in real time. Recording notes at meetings, or just thoughts and ideas, can sometimes be spontaneous. There’s nothing wrong with using a traditional paper pad and pen but when organising and searching for a specific note you wrote 6 months ago, things can prove to be difficult. Being an internet based company, we always try to keep everything on the cloud. This is where we use Evernote. It allows us to write our notes, attach files, record audio and video, collect clips including web pages and handwritten notes. With the Premium features, we can discuss, collaborate, and share notes between team members. 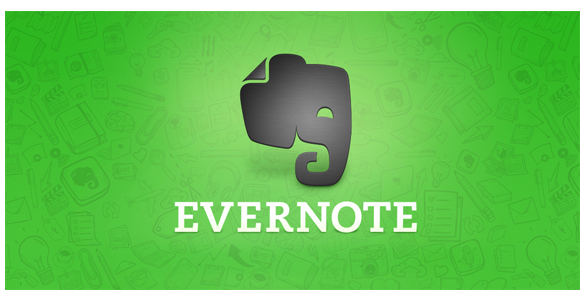 Evernote is available right at our finger tips, we can easily take down any note using our mobile or tablet device whilst on the go. When being so busy and having to juggle multiple projects at one time, keeping track of all things you need to accomplish is crucial. This is why having a to-do list is vital. We use Wunderlist to setup to-do lists. With Wunderlist we can create new a new list and add specific items and, as soon as you complete a task, you can just tick it off. Simple. You can even assign deadlines for each task, adding reminders and notes. 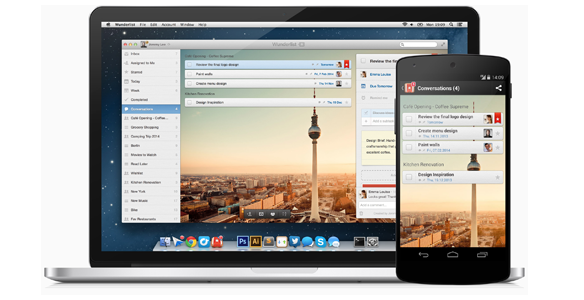 Wunderlist allows us to collaborate with colleagues by sharing our to-do lists. Being cloud based ensure that our to-do lists are always up to date and allows us to keep track of them on our mobile, tablet and desktop computers. This may seem like an excessive list of software to run but, with the help of these incredible applications, we’ve become much more productive. Obviously you shouldn’t adopt an application if you find it takes more time to manage it than actually doing the job at hand. What software do you use on a daily basis? Comment below.